I have been saying for years that the residential side of the modular housing industry has not congealed into a formidable group that can market what we sell to the new home buyer. Until yesterday, the almost forgotten Modular Building Systems Association (MBSA), once a leader in helping promote and further the efforts of modular home builders and factories, had laid dormant. Well surprise Boys and Girls, Ladies and Gentleman; Tom Hardiman, the executive director of the MBSA has told Modcoach that a new website has been launched and time, effort and money will begin flowing into both it and new marketing for the modular residential home builder. Good launch Tom and Tracey. I've noticed that the only information currently on the site is the same slim pickings as he old sight but now the site is ready, they will begin adding new information directed toward the new home buyer. So without further ado, here is the beginning of a new marketing age for our industry. Wait a minute Gary - is what you wrote the full story? Hardiman is employed by the MBI. MBSA shares the same address as MBI? Did MBI purchase MBSA? Why the connection? Is MBI underwriting costs for MBSA? With your association with MBI you must know the back story. Plus is MBSA viable with only 4 manufacturer members? MBI and MBSA have no direct employees. Both organizations are managed by an association management firm, of which Tom Hardiman is a partner. 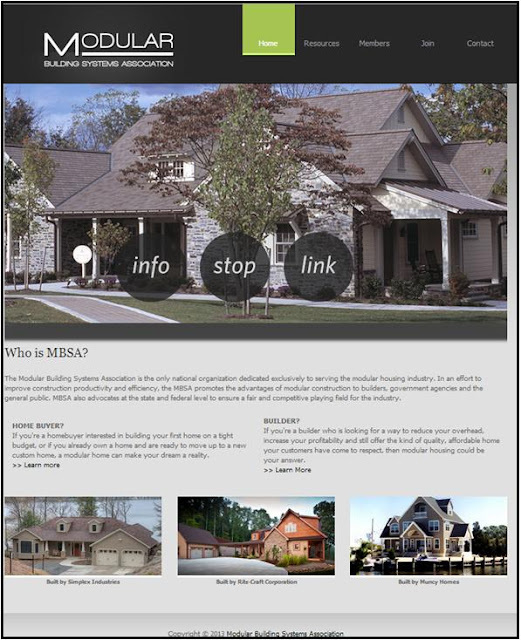 MBI and MBSA are two completely separate organizations. MBI is in no way underwriting MBSA, or vice versa. Here is hoping that MBSA will pay attention to the Western US in the residential and multi-family areas. A convention/meeting every now and then is not spreading the word out west. Education education education is badly needed out here.